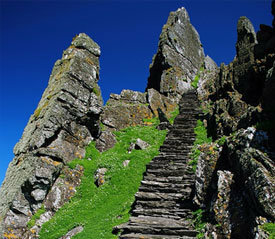 The waters surrounding the Skellig Islands are inhabited by an abundance of Marine Life. 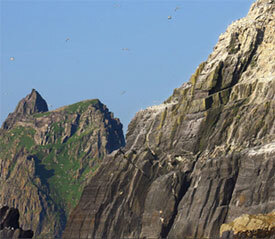 Bluenose Dolphins, Basking Sharks and Grey Seals are regularly encountered on our boat trips to the Skellig Islands, and on rare occasions Bluefin Tuna and even the majestic Humpback Whale make an appearance. Scroll down for more on marine life that occupies the surrounding waters. Characteristics: Blue sharks are light-bodied with long pectoral fins. Like many other sharks, blue sharks are countershaded: the top of the body is deep blue, lighter on the sides, and the underside is white. 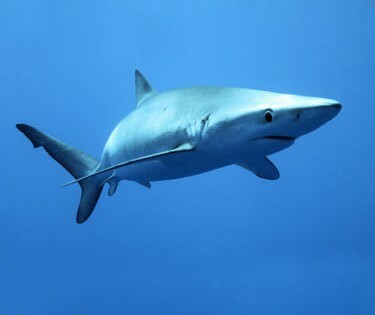 The male blue shark commonly grows to 1.82 to 2.82 m (6.0 to 9.3 ft) at maturity, whereas the larger females commonly grow to 2.2 to 3.3 m (7.2 to 10.8 ft) at maturity. Habitat: The blue shark is an oceanic and epipelagic shark found worldwide in deep temperate and tropical waters from the surface to about 350 metres. In temperate seas it may approach shore, where it can be observed by divers; while in tropical waters, it inhabits greater depths. It lives as far north as Norway and as far south as Chile. Blue sharks are found off the coasts of every continent, except Antarctica. Habits: Although generally lethargic, they can move very quickly. Blue sharks are viviparous and are noted for large litters of 25 to over 100 pups. They feed primarily on small fish and squid, although they can take larger prey. Maximum lifespan is still unknown, but it is believed that they can live up to 20 years. Characteristics: The body of the Atlantic bluefin tuna is rhomboidal in profile and robust. The head is conical and the mouth rather large. The head contains a “pineal window” that allows the fish to navigate over its multiple thousands-of-miles range. The color is dark blue above and gray below, with a gold coruscation covering the body and bright yellow caudal finlets.The Atlantic bluefin tuna has been the foundation of one of the world’s most lucrative commercial fisheries. Medium-sized and large individuals are heavily targeted for the Japanese raw fish market, where all bluefin species are highly prized for sushi and sashimi. Habitat: Atlantic bluefin are native to both the western and eastern Atlantic Ocean, as well as the Mediterranean Sea. Atlantic bluefin have become extinct in the Black Sea. The Atlantic bluefin tuna is a close relative of the other two bluefin tuna species—the Pacific bluefin tuna and the southern bluefin tuna. Habits: Bluefin dive to depths of 500 m (1,600 ft). They can reach speeds of 40 mph (64 km/h). 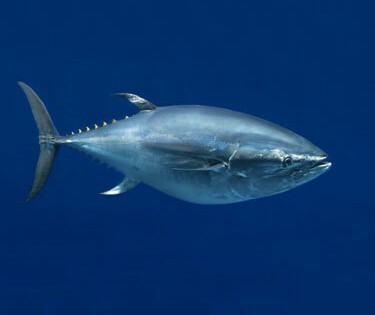 The Atlantic bluefin tuna typically hunts small fish such as sardines, herring, and mackerel, and invertebrates such as squid and crustaceans. 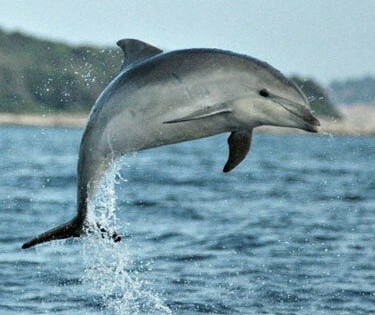 Characteristics: Bottlenose dolphins are grey, varying from dark grey at the top near the dorsal fin to very light grey and almost white at the underside. This countershading makes them hard to see, both from above and below, when swimming. Bottlenose dolphins can live for more than 40 years. They can jump at a height of 6 meters (20 feet) up in the air; and use this technique to communicate with one another. 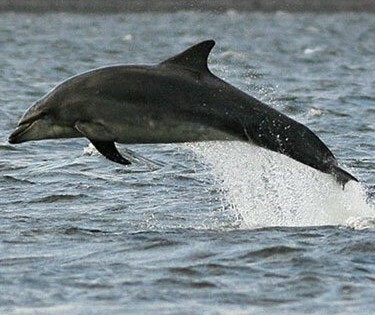 Habitat: Bottlenose dolphins inhabit warm and temperate seas worldwide. They live in all oceans except for the Arctic and Antarctic Circle area. Bottlenose dolphins live in groups typically of 10–30 members, called pods, but group size varies from single individuals up to more than 1,000. Their diets consist mainly of forage fish. Dolphins often work as a team to harvest fish schools, but they also hunt individually. Dolphins search for prey primarily using echolocation, which is similar to sonar. Habits: Dolphins are voluntary breathers, who must deliberately surface and open their blowholes to get air. They can store almost twice as much oxygen in proportion to their body weight as a human can. The bottlenose dolphin typically rises to the surface to breathe through its blowhole two to three times per minute, although it can remain submerged for up to 20 minutes. Characteristics: The fin whale – also called the finback whale, razorback, or common rorqual, is a marine mammal belonging to the suborder of baleen whales. It is the second-largest animal after the blue whale. The largest reportedly grow to 27.3 m (89.6 ft) long with a maximum confirmed length of 25.9 m (85 ft), and a maximum recorded weight of nearly 74 tonnes (73 long tons; 82 short tons). The fin whale’s body is long and slender, coloured brownish-grey with a paler underside. Habitat: Like many large rorquals, the fin whale is a cosmopolitan species. It is found in all the world’s major oceans and in waters ranging from the polar to the tropical. It is absent only from waters close to the ice pack at both the north and south extremities and relatively small areas of water away from the large oceans, such as the Red Sea although they can reach into the Baltic Sea, a marginal sea of such conditions. The highest population density occurs in temperate and cool waters. It is less densely populated in the warmest, equatorial regions. Habits: Like other whales, males make long, loud, low-frequency sounds. The vocalizations of blue and fin whales are the lowest-frequency sounds made by any animal. 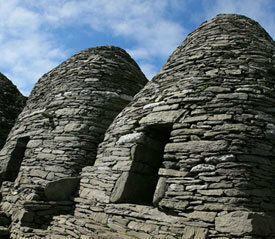 hen feeding, they blow 5–7 times in quick succession, but while traveling or resting will blow once every minute or two. On their terminal (last) dive they arch their back high out of the water, but rarely raise their flukes out of the water. They then dive to depths of up to 470 metres (1,540 ft) when feeding or a few hundred feet when resting or traveling. The average feeding dive off California and Baja lasts 6 minutes, with a maximum of 17 minutes; when traveling or resting they usually dive for only a few minutes at a time. Characteristics: The Grey seal is a very large seal, with bulls in the eastern Atlantic populations reaching 2.5–3.3 m (8.2–10.8 ft) long and weighing 170–310 kg (370–680 lb); the cows are much smaller, typically 1.6–2.0 m (5.2–6.6 ft) long and 100–190 kg (220–420 lb) in weight. Individuals from the western Atlantic are often much larger, males reaching 400 kg (880 lb) and females weighing up to 250 kg (550 lb). It is distinguished from the harbor seal by its straight head profile, nostrils set well apart, and fewer spots on its body. 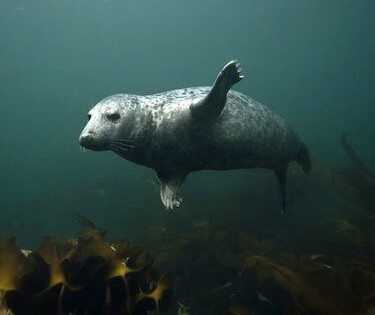 Habitat: In Ireland and the UK, the grey seal breeds in several colonies on and around the coasts. Notably large colonies are at Donna Nook in Lincolnshire, the Farne Islands off the Northumberland Coast (about 6,000 animals), Orkney and North Rona, off the north coast of Scotland, Lambay Island off the coast of Dublin and Ramsey Island off the coast of Pembrokeshire. Habits: During the winter months grey seals can be seen hauled out on rocks, islands, and shoals not far from shore, occasionally coming ashore to rest. In the spring recently weaned pups and yearlings occasionally strand on beaches after becoming separated from their group. Characteristics: The harbour dolphin is a little smaller than the other dolphins, at about 67–85 cm (26–33 in) long at birth, weighing 6.4–10 kg. Adults of both sexes grow to 1.4 to 1.9 m (4.6 to 6.2 ft). The females are heavier, with a maximum weight of around 76 kg (168 lb) compared with the males’ 61 kg (134 lb). The body is robust, and the animal is at its maximum girth just in front of its triangular dorsal fin. Habitat: Harbour dolphins prefer temperate and subarctic waters. They inhabit fjords, bays, estuaries and harbours, hence their name. 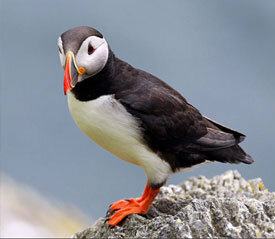 They feed mostly on small pelagic schooling fish, particularly herring, capelin, and sprat. They will, however, eat squid and crustaceans in certain places. Habits: Some studies suggest harbour dolphins are relatively sedentary and usually don’t leave a certain area for long. Nevertheless, they have been recorded to move from onshore to offshore waters along coasts. Dives of 220 m (720 ft) by harbour dolphins have been recorded. Dives can last five minutes but typically last just one minute. The social life of harbour dolphins is not well understood. They are generally seen as a solitary species. Characteristics: The humpback whale (Megaptera novaeangliae) is a species of baleen whale. One of the larger rorqual species, adults range in length from 12–16 m (39–52 ft) and weigh about 36,000 kg (79,000 lb). The humpback has a distinctive body shape, with long pectoral fins and a knobbly head. 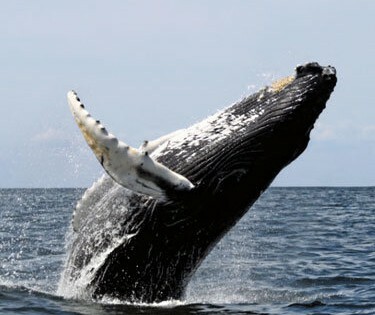 Habitat: Found in oceans and seas around the world, humpback whales typically migrate up to 25,000 km (16,000 mi) each year. Humpbacks feed in polar waters, and migrate to tropical or subtropical waters to breed and give birth when they fast and live off their fat reserves. Their diet consists mostly of krill and small fish. Humpbacks have a diverse repertoire of feeding methods, including the bubble net technique. Habits: It is known for breaching and other distinctive surface behaviors, making it popular with whale watchers. Males produce a complex song lasting 10 to 20 minutes, which they repeat for hours at a time. Its purpose is not clear, though it may have a role in mating. Characteristics: The minke whales are the second smallest baleen whale; only the pygmy right whale is smaller. The minke whale is a black/gray/purple colour. 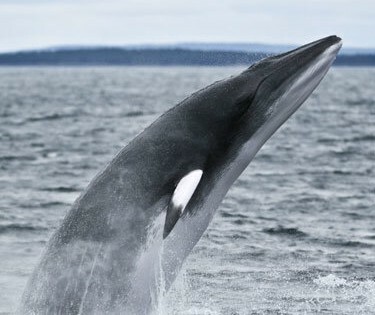 Common minke whales (Northern Hemisphere variety) are distinguished from other whales by a white band on each flipper. The body is usually black or dark-grey above and white underneath. Habitat: Due to their relative abundance, minke whales are often the focus of whale-watching cruises setting sail from, for instance, the Isle of Mull in Scotland, County Cork in Ireland and Húsavík in Iceland, and tours are taken on the east coast of Canada. They are also one of the most commonly sighted whales seen on whale-watches from New England and eastern Canada. Habits: The whale breathes three to five times at short intervals before ‘deep-diving’ for two to 20 minutes. Deep dives are preceded by a pronounced arching of the back. 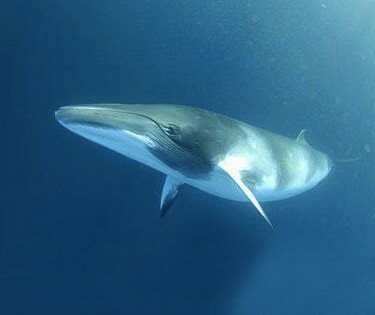 The maximum swimming speed of minkes has been estimated at 38 km/h (24 mph). 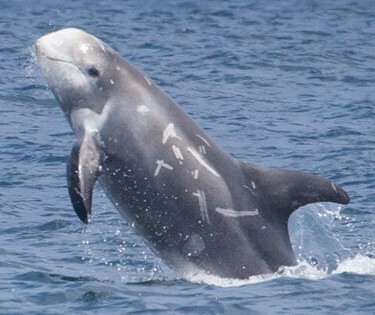 Characteristics: Risso’s dolphin has a relatively large anterior body and dorsal fin, while the posterior tapers to a relatively narrow tail. The bulbous head has a vertical crease in front. Risso’s dolphin is named after Antoine Risso, whose description formed the basis of the first public description of the animal, by Georges Cuvier, in 1812. Another common name for the Risso’s dolphin is grampus (also the species’ genus), although this common name was more often used for the orca. It is commonly known as the Monk dolphin among Taiwanese fishermen. Habitat: They are found worldwide in temperate and tropical waters, usually in deep waters rather, but close to land. As well as the tropical parts of the Indian, Pacific and Atlantic Oceans, they are also found in the Persian Gulf and Mediterranean and Red Seas, but not the Black Sea (a stranding was recorded in the Sea of Marmara in 2012). They range as far north as the Gulf of Alaska and southern Greenland and as far south as Tierra del Fuego. Habits: They feed almost exclusively on neritic and oceanic squid, mostly nocturnally. Predation does not appear significant. Mass strandings are infrequent. These dolphins typically travel in groups of 10–51, but that may reach 400. Smaller, stable subgroups exist within larger groups. They also travel with other cetaceans. They harass and surf the bow waves of gray whales, as well as ocean swells. 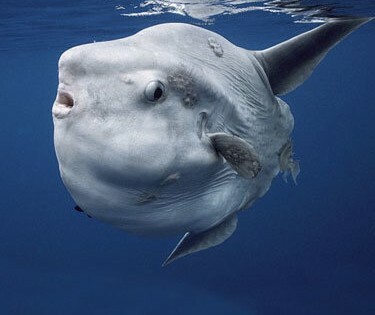 Characteristics: The ocean sunfish is the heaviest known bony fish in the world. Adults typically weigh between 247 and 1,000 kg (545–2,205 lb). The species is native to tropical and temperate waters around the globe. It resembles a fish head with a tail, and its main body is flattened laterally. Sunfish can be as tall as they are long when their dorsal and ventral fins are extended. Habitat: Ocean sunfish are native to the temperate and tropical waters of every ocean in the world. Mola genotypes appear to vary widely between the Atlantic and Pacific, but genetic differences between individuals in the Northern and Southern hemispheres are minimal. Habits: Sunfish live on a diet consisting mainly of jellyfish, but because this diet is nutritionally poor, they consume large amounts to develop and maintain their great bulk. Females of the species can produce more eggs than any other known vertebrate, up to 300,000,000 at a time. Characteristics: The Basking Shark is the second largest living fish, after the whale shark, and one of three plankton-eating sharks along with the whale shark and megamouth shark. Adults typically reach 6–8 m (20–26 ft) in length. They are usually greyish-brown, with mottled skin. The caudal fin has a strong lateral keel and a crescent shape. 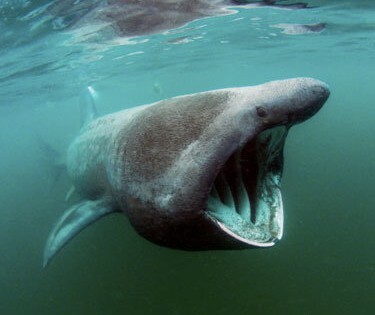 Habitat: The basking shark is a cosmopolitan migratory species, found in all the world’s temperate oceans. A slow-moving filter feeder, its common name derives from its habit of feeding at the surface, appearing to be basking in the warmer water there. Habits: Basking sharks are believed to overwinter in deep waters. They may be found in either small schools or alone. Small schools in the Bay of Fundy and the Hebrides have been seen swimming nose to tail in circles in what may be a form of mating behaviour. Despite their large size and threatening appearance, basking sharks are not aggressive and are harmless to humans.